As well as the Trafalgar and Cutty Sark, the waterside at Greenwich is blessed with another pub which is well worth a visit. Just minutes away from the imposing Trafalgar Tavern is The Yacht. Hidden away down a quiet terrace of onetime workmen's cottages, this old pub is a particular Greenwich favourite of mine. I like the warm atmosphere and unpretentious coziness of what was once a 'spit and sawdust' workingman's pub' I like the heavy wood paneling, the St. Austell's Tribute Ale, the picture windows overlooking the river and the reasonably priced bar menu offering good down to earth pub grub like fish and chips or traditional English Steak & Ale pie. There is no riverside terrace to sit out in the sunshine and watch the ships go by, (the Yacht is built right on the water's edge), and its very coziness means that you will be cramped for space whenit gets busyon theweekends. That said, the Yacht has great atmosphere, is patronized by friendly locals and, like all Taylor Walker pubs, offers friendly service, good cask beers good pub grub which includes a daily roast. Food served: Midday - 9pm. Price Guide: Fish and chips: 9.49. London Transport: Nearest tube. Cutty Sark. Riverside boat to Greenwich Pier. Wheelchair Accessibility: Yes. Toilets: Yes. 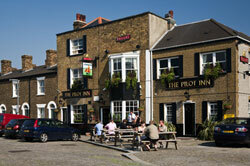 Downriver from The Yacht is another interesting old Greenwich pub, The Pilot. While not actually waterside, (the river is just a stone's throw away), this 200 year old hostelry has everything else to recommend it, including very comfortable 4star en-suite accommodation from 120 per night for a double room with full English breakfast. A small and very popular restaurant serves a traditional English menu with a daily fresh seafood option which may be trout, salmon, skate or seabass. There is an attractive beer garden for sunny days and off street parking. This is a boutique hostelry with just five rooms for accommodation, so book early! Venue: 68 River Way, Greenwich, SE10 0BE, England Tel: 020 8858 5910 . Price Guide: Fish and chips: 8.95. London Transport: Nearest tube. North Greenwich. Description: A perfect answer to your accommodation problems if visiting the O2 Arena, or London ExCel just across the river via the Blackwall Tunnel. 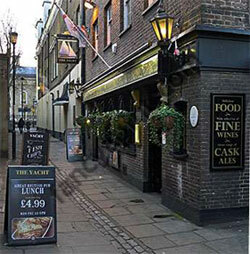 Travelling upriver from Greenwich to Southwark, we find one of London's most historic pubs. Situated on the south bank of the river, it was one of the very few London alehouses to have survived the 1668 Great Fire of London. It was from this "little alehouse on bankside" that Samuel Pepys witnessed the awesome destruction of London, having sought refuge from the fire and the "fire drops" falling on him while fleeing the city in a rowboat. The pub was originally built in 1615, was rebuilt in 1676 after a fire and has grown over several centuries. The main dining room has wonderful views across the Thames to the City, a first floor balcony and a riverside terrace offering outdoor seating. Thanks to its riverside venue and historic background, the Anchor is sometimes overwhelmed and service suffers, so be warned. Visitors often eat at the nearby Globe Theatre's Swan at the Globe which offers an innovative menu, attentive staff and magnificent waterside views.